In case you haven't noticed there's war on the horizon and with public opinion running so high against it, it's unsurprising that there are a lot of musicians willing to make their voices heard in support of peace. The London Stop the War Coalition has managed to attract a very impressive list of people to contribute to this double-CD compilation. If you're expecting one long boring collection of hippies and folkies singing about flowers, or a load of punks ranting, then you might be surprised by what's actually on this - Ms. Dynamite, Massive Attack, Roots Manuva and Coldcut line up alongside the usual suspects, Chumbawamba, Alabama 3, Billy Bragg and Crass and some less well-known names (including some folkies, hippies and punks), for a varied and largely intelligent collection of opinions and commentary. Ani Difranco's 'Self Evident' kicks it all off, a beat-style poem laying out what it's all about and voicing the feelings of many Americans, first 11th September and its effects, then the horror at how it's been hijacked by militants. The acoustic mix of Chumbawamba's 'Jacob's Ladder (Not in my name)' is on much the same theme, how "nine eleven got branded" and is now used to rubber-stamp anything the US government wants to do. Crass' classic 'Nagasaki Nightmare' and Slovo's '21 today' work well together, the first an attempt to put the nuclear bombing of Japan into raw and uncomfortable music, the latter a simple list of countries bombed by the US since Japan, names and dates over a slow mournful backing track. CD1 ends with the optimistic sounds of the fabulous Massive Attack song 'Hymn of the big wheel'. 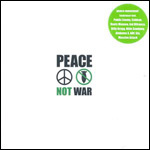 Ms Dynamite opens CD2 with a simple and honest acapella piece against violence, while Roots Manuva contributes 'Juggle tings proper', a track about global injustice. Alabama 3 add the brilliant anarchic 'Woody Guthrie' from their last album to the mix. Persian Carpets' tongue-in-cheek 'Allah save queens' is a rant against cultural imperialism based on the Pistol's 'God save the queen'. A couple of artists make use of the words of prominent voices against war, The Unpeople sampling John Pilger, the Asian Dub Foundation mixing a Tariq Ali talk in 'Not in our name' and Torben & Joe use a couple of voices on 'Money is your blood', adding a level of clear intelligent commentary to the music. There are some bum notes, such as Ginger Tom's use of the truly naff "Hey, hey USA, how many kids did you kill today" slogan preferred by some protest groups. If you're going to make a statement, make it intelligent, please. In stark contrast is one of the few folk groups on this, Seize the Day, whose track 'United States' is a well argued and nicely performed acoustic piece against the US government's policy. Public Enemy's 'Son of a Bush' is a reasonable track, but they're not really the band they used to be, "He's the son of a bad man" isn't exactly in the same vein as the firebrand choruses they used to come out with, is it? But, all the same, it's a great collection of varied music and a lot of truly thought-provoking material to mull over. And it's all in aid of the anti-war effort as well.